In this guide, we will show you how to use the VideoSource APIs to share video in a Room. These APIs allow you to choose the built in camera(s), or any other source of content that is available to your application (or extension). The VideoSource APIs describe producers and consumers of video content. A TVIVideoSource produces content for a TVILocalVideoTrack. Sources have the following properties. VideoSources produce VideoFrames, and deliver them to VideoSinks. VideoSources receieve format requests, and deliver requests to VideoSinks. The recommended maximum frame size is 1920x1080. The recommended maximum frame rate is 30 frames per second. The recommended pixel format is NV12. A TVIVideoSink consumes content from a TVIVideoSource. Sinks have the following properties. VideoSinks handle format requests from VideoSources. VideoSinks consume frames from VideoSources. In the next section we will show you how to use the CameraSource API. A TVICameraSource is a TVIVideoSource that produces content from the built-in cameras. This is probably the first kind of video that you want to share, so it is a good place to begin. First we want to create a TVICameraSource, and use that source to create a TVILocalVideoTrack. Now that we've setup our Track and Source, its time to start producing frames from one of the built-in cameras. Lets use a TVICameraSource utility method to help us discover a front facing AVCaptureDevice. // The device does not have a front camera. // Start capturing with the device that we discovered. In this example, TVICameraSource is automatically determining the best format to capture in. Typically, 640x480 at 30 frames / second is used as the default value. Next, we want to connect to a Room with the TVILocalVideoTrack we created earlier. While you can select a single device at start time, TVICameraSource also supports switching devices while it is already running. For example, you could switch from a front facing device to a rear facing device. // The device does not have a rear camera. At some point after connecting to a Room, you might decide that you want to stop sharing video from the camera. Start with unpublishing the Track. // Unpublish the Track. We will no longer be sharing video in the Room. Finally, we will stop the source and destroy the objects. // Stop capturing from the device. // Assume that we discovered "frontDevice" earlier. When run on an iPhone X with iOS 12.1.2, the following formats are returned. Once you've determined which format that you would like to use, you can provide it when starting capture, or selecting a device. // Formats are ordered by increasing dimensions. Pick the smallest size. Produce video that fills a portrait iPhone X / XR / XS screen. These are both cases where you want to publish video in a different aspect ratio or size than AVCaptureDevice can produce. That is okay, because format requests are here to help with this problem. let frontDevice = TVICameraSource.captureDevice(for: .front)! // We match 640x480 directly, since it is known to be supported by all devices. // The perferred format could not be found. // Request cropping to 480x480. The following diagram shows the effect of a format request on frames produced by TVICameraSource. Take a look at the iOS QuickStart Example to learn more about using TVICameraSource. Reducing the number of bits allocated to the encoder. Downscaling the video temporally (dropping frames). Cropping (minimal, to ensure pixel alignment). Cropping, and scaling operations are only performed once. 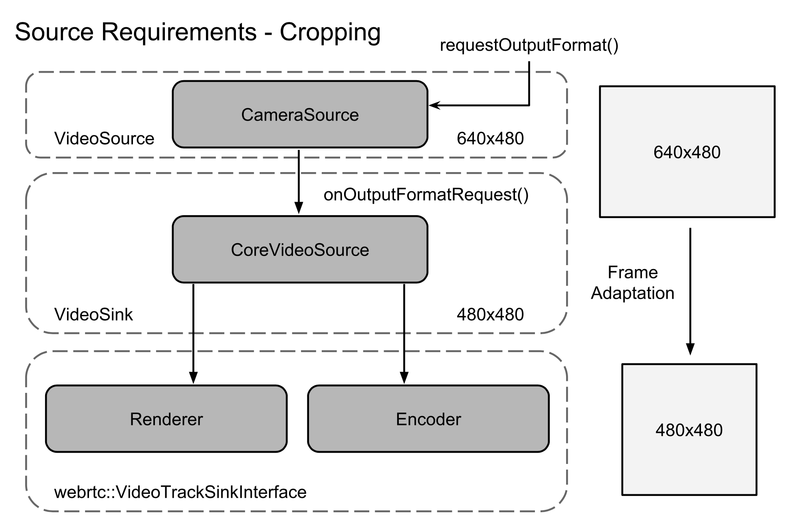 If the video pipeline drops a frame, the pixels need not be touched at all. If you would like to explore writing your own VideoSource, then an excellent place to begin is with our sample code.